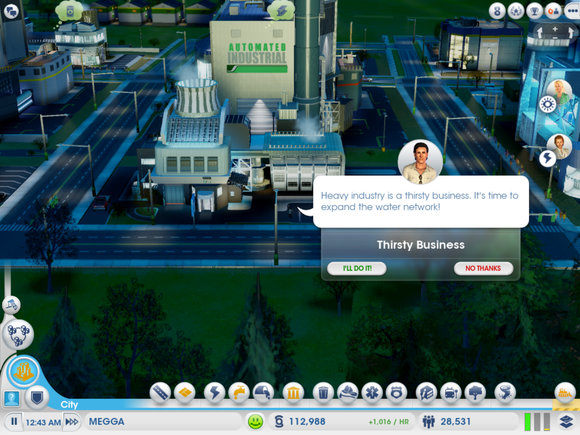 Few franchises stir the imagination and the awe of gamers quite like Maxis’ SimCity. Both educational and fun, it was the first world builder video game that allowed the player unrivaled abilities to play god—even back in 1989 in your school’s computer lab, you could turn your city into a sprawling metropolis or burn it to ash. From this humble beginning came iconic titles like SimCopter, SimCity 2000, and the juggernaut Sims franchise. This latest iteration, titled simply SimCity, is both the sequel to SimCity 4 and a reboot of the franchise. While the new SimCity is in many ways more approachable and fun than ever, the move to multiplayer gameplay created severe gameplay issues, creating a frustrating and at times broken game. In SimCity, your metropolis has never looked so clean, crisp, and vibrant. The new engine creates unrivaled detail in the game world, allowing players to see individual trucks, sims, and street corners. The little digital ant farm you’ve created is also full of many choices, from how to plan your cities’ roads to what industries you specialize in (gambling, technology, etc. ), how you develop utilities, and even some microscopic details like tax rates for the different classes of people who dwell in your fictional city. Thanks to the amazing detail, choice, and control, you really do feel godlike, for my money—more so than even in games like Civilization or Black & White. Throughout the history of SimCity, Maxis kept expanding on the number of aspects of your city you needed to track, moving beyond power and water to things like waste, pollution, and trash—and as a result, the interface became more and more unwieldy. 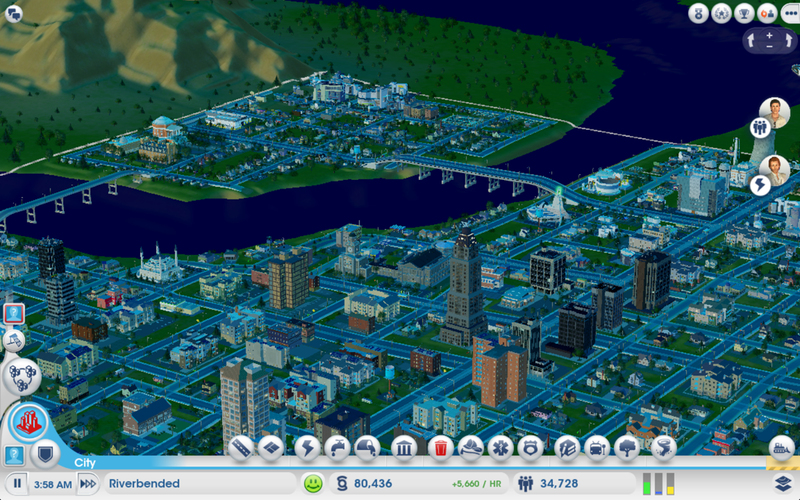 In the new SimCity, Maxis has done an admirable job of streamlining the interface, using a great deal of the trappings of the Sims 3. You’ll have goals such as “Plop a Community College” and “Get 1000 students in a day” that can result in bonus simoleons and needed direction. The result is a game that never feels overwhelming despite being very, very complex. My experience with the launch was much smoother than some others’ in the press, mainly owing to the timing of my review. I pulled double-duty and chose to tackle (wisely, it turns out) Bioshock Infinite first so I didn’t get to SimCity until a few days later. 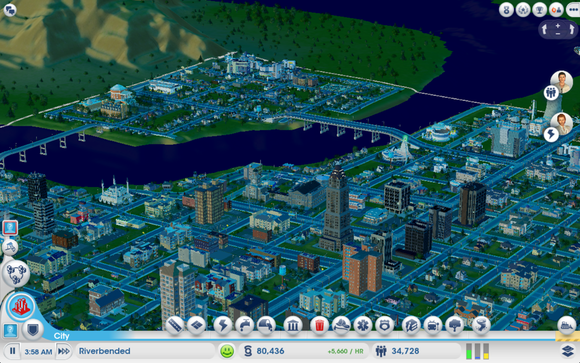 Even then, SimCity did crash during my initial tutorial run and I had some major slowdown issues for the first day. I did not, as some have reported, have difficulty putting the game on Cheetah mode (the fastest mode). If you’re reading this review, I can assure you that launch period issues should no longer affect you, so I’m not one of those reviewers who is dinging the game’s rating based on launch issues. 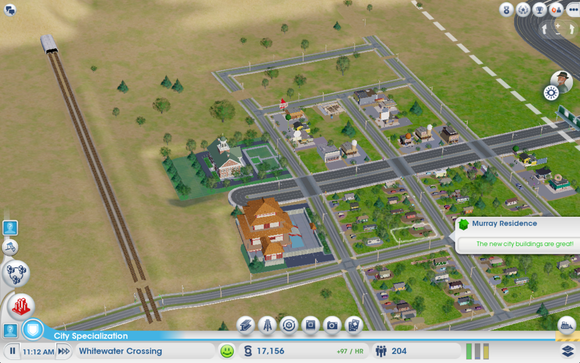 But there are larger problems with SimCity that linger and make it difficult to recommend. Electronic Arts made the controversial decision of making SimCity multiplayer-centric because hey, what could be better than building a world with your friends? It certainly worked for games like Minecraft. Unfortunately, EA didn’t seem to account for players who simply don’t want to play with other people, so when you start a new game and build your city you’ll find yourself punished by not having other people in the area to share resources. Why they couldn’t program AI cities to play with you I have no idea. After a few hours, you’ll realize that you either have to build the other cities yourself or just make do. By playing alone, you aren’t missing out on minor resources, either: having one player specialize in tourism can affect the entire region, or having one player with great oil resources can save you the trouble of buying your own power plant. It’s a huge deal, and cannot be overstated: SimCity is now a multiplayer game and playing without other people is going be much more difficult and limiting. Since the game is multiplayer-centric and yes, must always be connected to the Internet, other problems persist even beyond the disastrous server crashes. Your sandbox is now much smaller than in previous games. Part of the reason why the game offers you city specializations (culture, gambling, technology, etc.) is because you can no longer just keep expanding and assume you can build everything. Once you’ve taken care of utilities and basic services like fire, police, and transportation, you’ll find you’ve run out of room to build things like stadiums, seaports, or many specialized buildings. By hour three, I was bulldozing buildings and roads in the hopes of cramming more stuff into an already crowded space. The small stage creates a whole host of problems that fundamentally change the way you play the game. 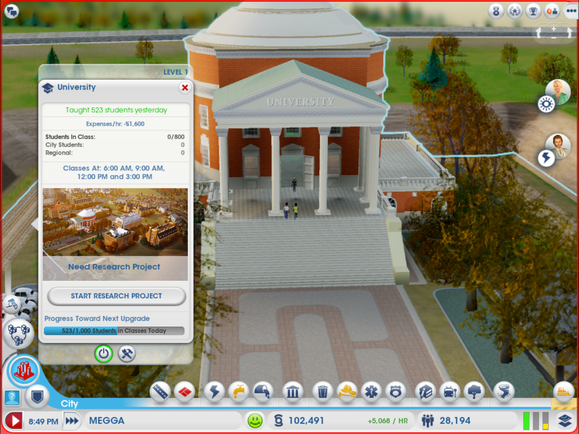 Now the game is overly focused on upgrading your roads and parks in order to entice that ever elusive middle class. This is a real shame, because the developers have done a great job of creating some really fantastic late-game structures and sights to see. You want to be able to specialize, you want to see your city transformed into a technological hotspot or a gambling den. But the small map and need to take care of certain services first ensures you won’t get to try out many of the unlockable specialized buildings until very late in the game—and even then you can only choose a handful that must be carefully crammed in with everything else. This funnels you into infrastructure choices that, while realistic, get boring quickly. The problems with Sim City can be traced back to a single decision: after seeing you playing happily in your sandbox for over two decades, the developers decided that you need to play with others and share your toys. This shift from single player to multiplayer has created the server issues, the slowdowns, the smaller map sizes, the shorter gameplay cycles, the reliance on resource sharing—the problems of the game. With millions of sales already and EA’s seeming unwillingness to address these issues, we’re left to judge the game in front of us as the best it’s going to be. Unfortunately, that’s not going to be good enough for a lot of people. Personally, I’m going to keep exploring what is an exceptionally creative and interesting world, but I’ve resigned myself to shorter play sessions and moments that break my immersion—to put it another way, gone are the days where I’d lose entire weekends building up my sprawling metropolis. And to many like-minded gamers who grew up with Maxis games, that’s the saddest part of this. The modernization of SimCity is welcomed, but Electronic Arts has changed the dynamics of the game so much that the new version will be a shock to long-time fans.